Kitchen looks gorgeous. That garland is pretty far up there. Where was Matt when all this was going on? Matt was out. I had everything cleaned up and de-glittered by the time he came back ;). Hope you had a great Thanksgiving! 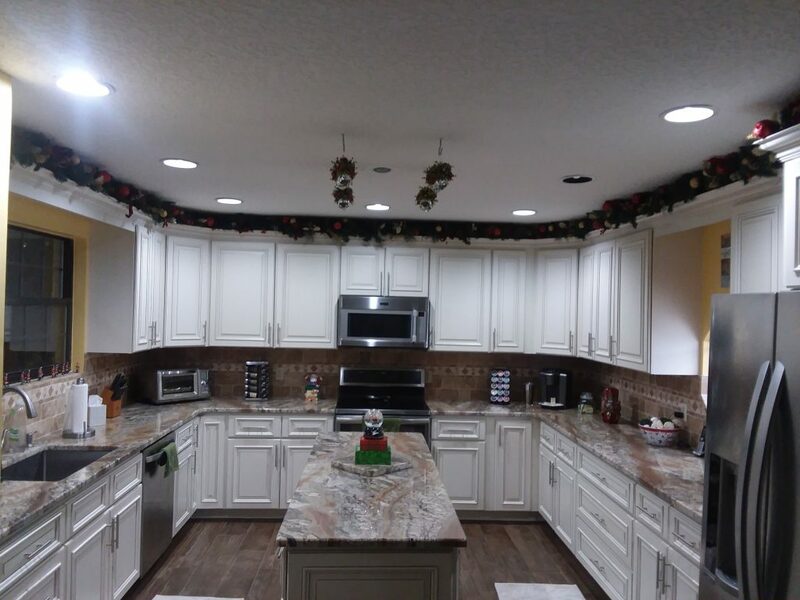 Happy Thanksgiving, your kitchen looks cheery and wonderful! I hope you had a good Turkey Day. I hosted. We had a house full and a lot of joy. Wow, nice spacious kitchen. Am I getting old, or do I remember you saying you don’t cook much? Cause that’s a nice size for doing some serious cooking. Great job with the garland trim. I would have probably fallen off the ladder. You remember correctly: I don’t cook much. Hubby does, though, so it’s all good :). Thanks for the article. I’ve tried medical marijuana for my migraines. Thus far, it hasn’t helped much with the pain (maybe I didn’t use enough.) It does help with the nausea when that gets bad, however.